Riboprofiling identifies Arhgef12 as the most highly expressed RhoA guanine exchange factor in airway smooth muscle. (A) Schematic of smooth muscle RNA riboprofiling of trachea from acta2-CreERT2/Rosa26loxpSTOPloxpRpl10a-mCherry mice. (B) Immunofluorescence of trachea from acta2-CreERT2/Rosa26loxpSTOPloxpRpl10a-mCherry mice. Scale bar: 200 μm. (C) Validation of smooth muscle specificity of riboprofiling by qPCR of smooth muscle and non–smooth muscle genes (n = 4 mice). PD, pulldown. 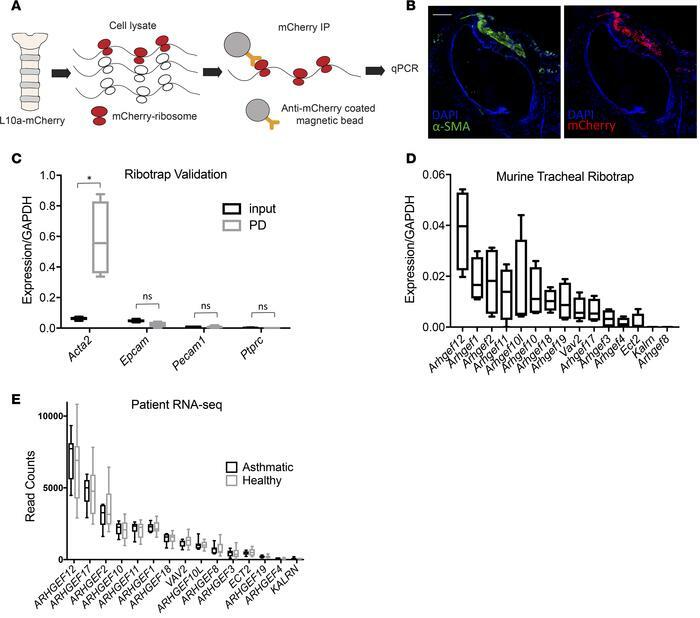 (D) Riboprofiling of mouse tracheal RhoGEFs in healthy mice (n = 4 mice). (E) RhoGEF expression in airway smooth muscle from asthma patients (n = 7) and healthy controls (n = 12). Where 2 samples were available (4 of 7 asthma patients), counts were averaged. Box plots show minimum, maximum, and median, with 25th to 75th percentile range. *P < 0.01 by 1-tailed Student’s t test.